A Special Meditation Retreat & Blessings Pooja will be held on Saturday 30th June 2018 at Dhamma Nikethanaya Buddhist Cultural Centre to mark the Poson Full Moon Day. Observing Eight Precepts and meditation retreat will start at 8AM and Atavisi Buddha Vandana and Bodhi Pooja will start at 5PM. All are welcome to join! Greetings from Dhamma Nikethanaya Buddhist Cultural Centre! Wishing You A Very Happy Dawn of Poson Full Moon ! 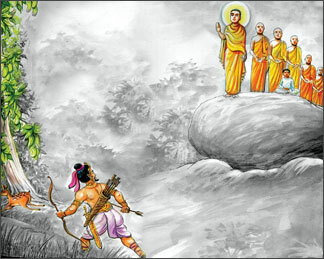 Next to Vesak, Poson is the most important full moon day in the Buddhist Calendar. This festival celebrates in Sri Lanka on the full moon of June (Poson). This full Moon marks the launch of Buddhist Mission in 247 B.C. By Emperor Asoka in India and It commemorates the first arrival of Buddhism in the island (Sri Lanka) following the conversion of King Devanampiya Tissa by Mahinda, the monk son of Emperor Asoka. Anuradhapura and Mihintale, where Mahinda met and converted the Sinhalese king, are the main sites for this celebration. During the festival, thousands of white-clad pilgrims climb the stairs to the summit of Mihintale. 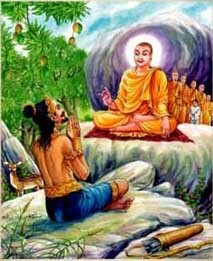 To make sure that the king was intelligent enough to understand the Dhamma, Mahinda Thera asked him some simple questions, which are given below. Reading them, you might think how stupid these questions seem to be. Read them carefully and you'll see that they are NOT as simple or as stupid as they appear. To answer them, you need to think clearly and sensibly. Here are the questions of the first Intelligence Test on record. Q: What name does this tree bear, O King? A: The tree is called mango. Q: Is there another mango tree besides this? A: There are many mango trees. Q: Are there any trees other than this mango tree and other mango trees? A: There are many trees Sir, but those are not mango trees. 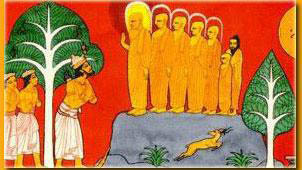 Q: And are there, besides other mango trees and those trees which are not mango trees, yet other trees? A: There is this mango tree, Sir. Thou has a shrewd wit. "O ruler of men" said the Thera. The catch was in the last question. The king had thought carefully and answered correctly and quickly. “O’ Great king! The birds of the air and the beasts on the earth have an equal right to live and move about in any part of this land as thou. The land belongs to the people and all other beings and thou art only the gardian of it. Let us respect to the Freedom of Living of ALL!